This is perfect cocktail for you and your Valentine and here’s how to make it at home! At Hilton Head Distillery, we believe in crafting new experiences that are adventurous, indulgent and rooted in tradition. Our craft is our adventure – a never-ending exploration of the senses, and a journey across infinite possibilities. We hope you join us on our voyage and enjoy signature cocktails made with our craft spirits! This is perfect cocktail for you and your Valentine.Combine Mountain Peak, raspberry liqueur, and chocolate syrup in a shaker full of ice. 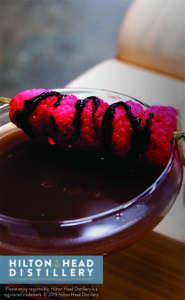 Shake vigorously, pour in glass, and top with a raspberry garnish with a chocolate syrup drizzle. Claim cocktail greatness! Please enjoy responsibly. Hilton Head Distillery is a registered trademark. © 2019 Hilton Head Distillery, 14 Cardinal Road, Hilton Head Island, SC 29926. 843-686-444 , [email protected] or hiltonheaddistillery.com.